La Conner was named for the wife of John Conner, founder of this charming community. L.A. Conner, for Louisa Ann Conner, ultimately became La Conner. Since history is so prominent in this town, it’s listed on the National Register of Historic Places. No surprise. Skagit County Historical Museum is here. 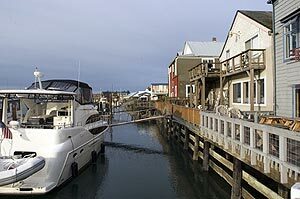 First Street along Swinomish Channel, a long waterway from Padilla to Skagit Bay, is a shopper’s paradise. Little pocket parks along this street are ideal for viewing both waterfront and, to the East, fertile farmland with Mount Baker in the background. Watch for intriguing names like MoNA (Museum of Northwest Art), Channel Lodge, Moon Rose (antiques), Step Outside (shoes), Olive Shoppe and Wild Iris Inn. Captivating festivals throughout the year entice visitors who learn why this town is one of the top tourist attractions in the Northwest. Skagit Valley Tulip Festival in the spring, Arts Alive! in November alternate years, La Conner Arts Festival in June and La Conner Sculpture Walk all year. Check out unique sculptures through the town to be viewed or bought by contacting the Chamber of Commerce. An informative plaque graces each piece. The Quilt Museum in historic Gaches Mansion, in one of a number of Victorian-era mansions, earns the distinction of being one-of-a-kind in the Northwest, and even rare in the U.S. New quilts are displayed every few months. Take a step back in history as you leisurely shop in the downtown district for unusual experiences in a unique place. Quaint shops, great restaurants and sightseeing are here. Water enthusiasts can catch the La Conner Classic Yacht and Car Show in September or the Smelt Derby in February. A working waterfront town, commercial fishermen still bring in their catch. Boaters can pull up to a waterfront restaurant for a break from cruising. This town’s charm is non-stop. So much to see and do in one small town is mindboggling. Stop by and see it for yourself.